In the last series, called The Trader’s Pendulum, we took you through the 10 Habits, all aimed to support a successful trader. Your mission in developing these habits is to get out of the Technical Trader’s Trap and transform into an Entrepreneurial Trader so that you can start being accountable to your trading. We invited you to act and begin your journey by completing the Trader’s Scorecard (http://www.traderspendulum.com) and to get down to business by arranging a free coaching session. In this Indicator Series, we talk about the mechanics of trading. The Detrended Price Oscillator (DPO) is a lagging oscillating cycle indicator. The DPO identifies cycles by comparing a previous price to a displaced simple moving average. The Detrended Price Oscillator (DPO) is a lagging, oscillating cycle indicator. It is used to remove trend from price to identify short-term market cycles. Since the DPO is offset to the left, it doesn’t consider current price action and is not aligned with the current candle. This helps to remove current trend. DPO = Close – (Moving Average ((n / 2) + 1)) days ago), where the oscillator is shifted by 20/2 +1, or 11 days when the SMA is 20. This makes the look-back period 11 days prior, and the DPO is calculated as Close – SMA (11 periods ago). The DPO is not considered a momentum oscillator, as it measures past prices against a simple moving average to measure the cycle’s length and high / low range. The DPO is not meant to generate buy and sell signals but is a way to help identify the market cycles. Using it in conjunction with Elliott Wave analysis or other techniques is ideal. 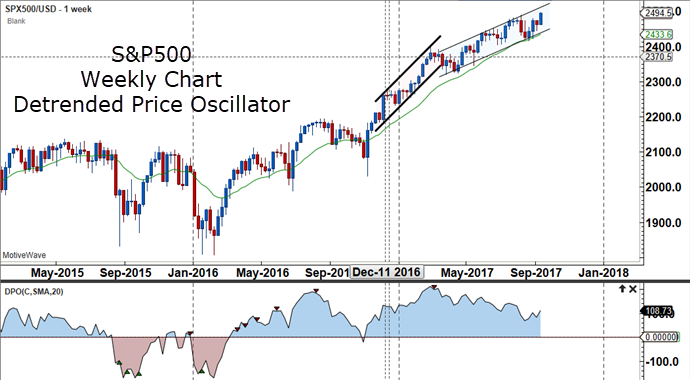 In the above S&P500 Weekly Chart, prices are detrended to enable traders to see the overbought and oversold levels which are turning points for the short-term market cycles within the long-term cycle. Trend identification – Identify the trend and use the DPO to follow the trend using the zero line. 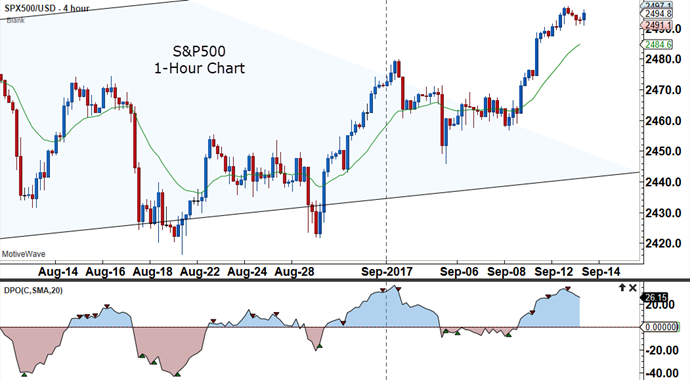 For example, in the hourly S&P chart below, use a cross above the zero line to confirm long trades and a cross below to identify short trades. Trend continuation – In a strong uptrend, use the DPO to buy into the trend once the oscillator comes back to the zero line and turns up again. In a downtrend, use the DPO to sell into the trend once the oscillator comes back to the zero line and turns down again. In the hourly chart below, take only long trades when the oscillator comes back to or slightly below the zero line and turns back above the zero line. Overbought/oversold market turning points – Use the DPO to sell at oscillator peaks once it turns down with price confirming and buy at oscillator troughs once it turns up with price confirming a reversal. (look at the reversal candlestick patterns at market turning points) Divergence works well here too. In the hourly chart below, during the choppy sideways market to the left, buy at oscillator troughs and sell at oscillator peaks. 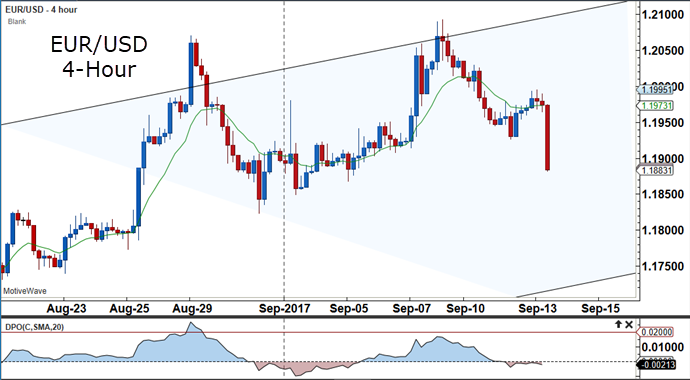 In the EUR/USD 4-Hour chart below, a buy opportunity exists when the DPO crosses below the zero line and crosses back up. The trader avoids the messy consolidation and enters long when the DPO crosses above the zero line. The same pattern exists in the S&P chart above after August 28th. Price makes a trend move up, then retraces, and continues its move higher. The DPO stays above the zero line for the first swing move higher, then dips below the zero line briefly. A long trade is triggered once the DPO moves back above the zero line in blue territory. Learn how the Detrended Price Oscillator helps put traders in the trend as it is progressing. Start incorporating the DPO indicator into your chart set-up. Finally, use the DPO indicator in developing trading strategies with other indicators. See you next week with another “D” indicator! If your mission is to become a trader or investor who stays out of the Technical Trader’s Trap, then take the leap to grow into an entrepreneurial trader. I created the FX Trader’s EDGE Coaching Program modelled after the “10 Habits of Successful Traders”, which is the title of my newly published book by Wiley. The Trader’s Pendulum: The 10 Habits of Highly Successful Traders. Copyright (c) 2015 by Jody Samuels. This book is available at all bookstores, online booksellers, and from the Wiley web site. This entry was posted in Trading Tips and tagged day trading, Detrended Price Oscillator, forex trading, forex trading online, forex trading system, trading. Elliott Wave EUR/USD: Get ready for the bullish trade! Elliott Wave EUR/USD: Bullish Setup Ahead!